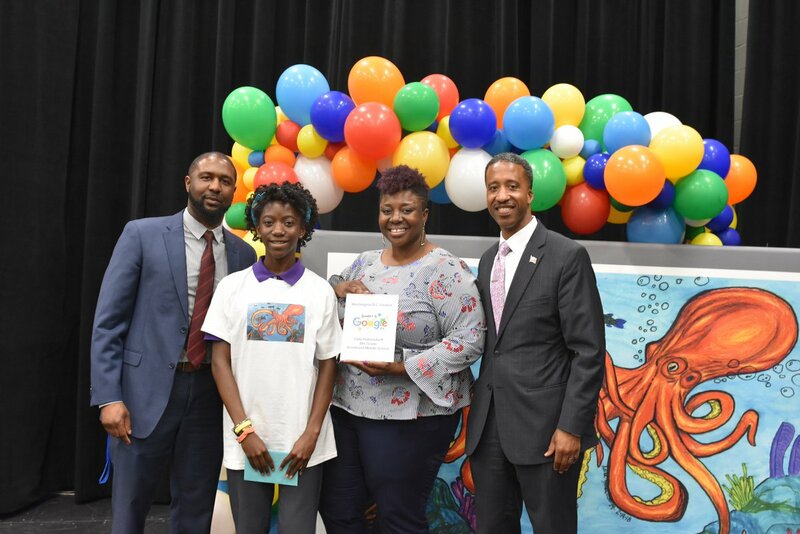 Councilmember McDuffie at Brookland Middle School to honor 8th grader Laila Holsendorff with a DC Council Ceremonial Resolution for winning the Google Doodle state competition for D.C.! As our students and teachers prepare to wrap up the school year, the amazing work that our students are accomplishing has not slowed down. Four of our city’s best students have been recognized nationally for their creativity, intelligence, and problem-solving skills. Brookland Middle School’s very own Laila Holsendorff, an 8th grader, was selected as the 2018 Doodle for Google contest winner for Washington D.C. Laila is now in competition to become the 8th/9th grade national finalist. I am very proud of Laila’s success and even more excited that Laila will be attending McKinley Technology High School here in Ward 5. 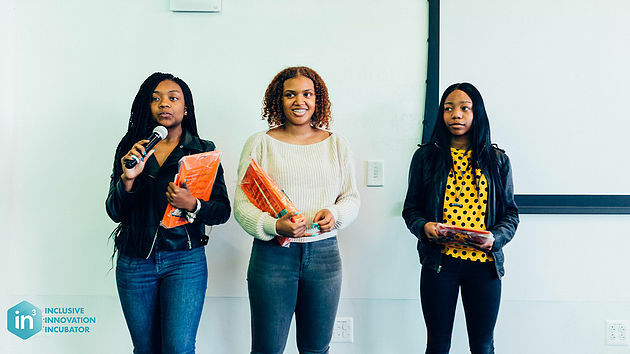 India Skinner, Mikayla Sharrieff and Bria Snell 11th graders at Banneker Senior High School were recently named finalists in the NASA Optimus Prime Spinoff Promotion and Research Challenge. Working with D.C.'s new Inclusive Innovation Incubator (In3), the teens developed a water purification system to provide clean and pH balanced water in public school water fountains. Laila, India, Mikayla, and Bria have represented their families and the entire city well. I applaud the faculty and staff at Banneker High School and Brookland Middle School and the dedication they display every day for their students. These young women are the future of this city, we are proud of what they have already accomplished -- and look forward to following their future accomplishments as well. The District of Columbia has some of the best educators in the country and in honor of teacher appreciation week I want to share my gratitude for all of the amazing work they do. India Skinner, Mikayla Sharrieff and Bria Snell, the members of the "H2NO to H2O" team that was a top 10 finalist for the NASA Optimus Prime Spinoff Promotion and Research Challenge. Councilmember McDuffie is joined by Mayor Bowser and Deputy Mayor Kenner on Rhode Island Avenue NE to announce the latest round of awardees of D.C.'s Great Streets grant program. Since Councilmember McDuffie has been in office, 44 small businesses in Ward 5 have received a Great Streets grant. Councilmember McDuffie celebrated Ward 5 day at Nats Park with the McKinley Technology High School Softball team joining him on the field before the game. Councilmember McDuffie kicked off DC Small Business week last Monday with remarks at the Shop Made in D.C. The D.C. Senior Advisory Coalition advocates for policies important to our most mature residents. Councilmember McDuffie met with their Ward 5 members on a recent lobby day. The Ward 5 parent-advocates with Parents Amplifying Voices in Education (PAVE) met with Councilmember McDuffie to discuss education priorities and the importance of Out of School Time, like aftercare and summer programs. Councilmember McDuffie presented a Ceremonial Resolution on behalf of the Council commemorating the 70th Anniversary of the Hurd v. Hodge Supreme Court case that banned enforcement of neighborhood racial housing covenants in the District. The house at the heart of this case is on the 100 block of Bryant St NW, in Ward 5's Bloomingdale neighborhood. Councilmember McDuffie joined the members of the Woodridge Civic Association for their monthly meeting. 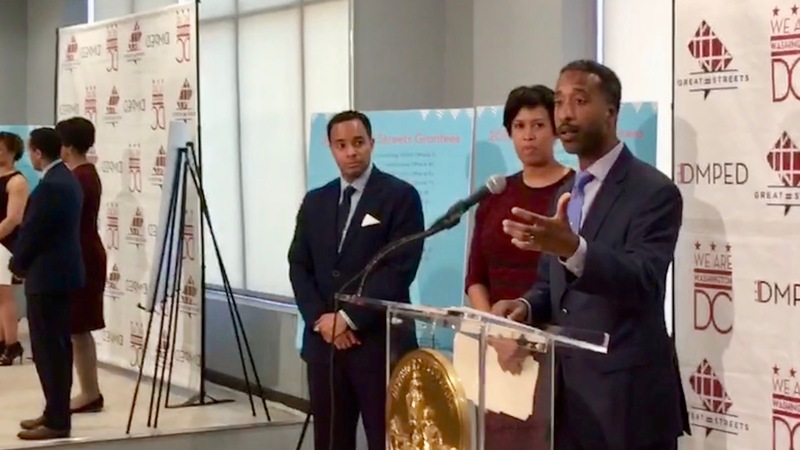 Councilmember McDuffie spoke on a panel hosted by the Missionary Baptist Ministers' Conference of Washington, D.C., speaking about the intersection of public health policy and criminal justice. Councilmember McDuffie speaking with residents at the civic association where he used to serve as president, the Stronghold Civic Association. 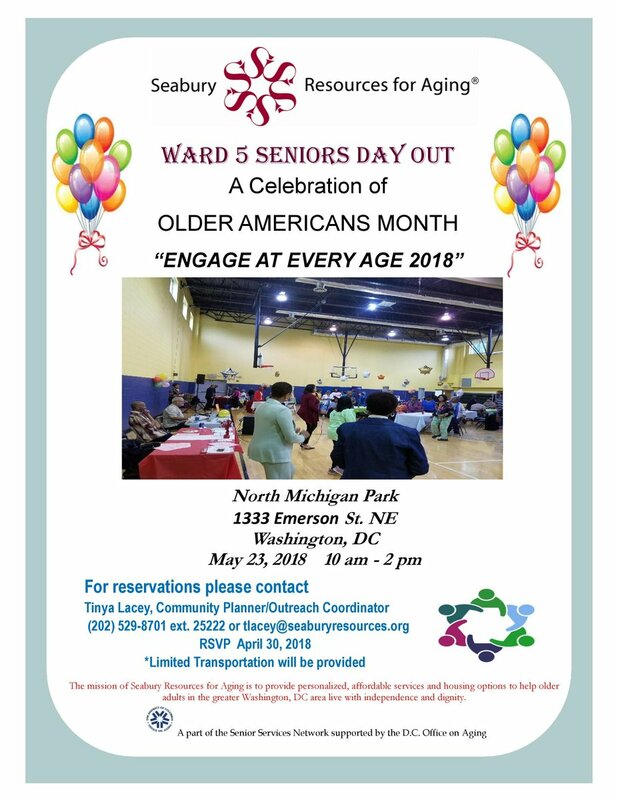 On May 23rd, 2018 Seabury Resources for Aging will be hosting Ward 5 Seniors Day out in celebration of Older Americans Month. The Seabury Resources for Aging mission is to provide personalized, affordable services and housing options to help older adults in the greater Washington, DC area live with independence and dignity. D.C. Department of Health and Humane Rescue Alliance will present a series of Animal Health Fairs across D.C. The Ward 5 Animal Health Fair will take place at Two Rivers PCS at Young School on Saturday, May 19 from 9:00 am - 11:30 am. The fairs offer free onsite vaccinations for dogs and cats of District residents, opportunities to obtain dog licenses, and the chance to learn more about D.C. animal laws and to speak with veterinarians about your pet’s health.